here are some updates and also some new things about the competition. There have been minor changes to the Sunday’s timetable concerning the Kaustinen hall. Take a look at the updated timetable! 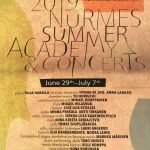 The changes concern the following enembles’ rehearsal and performance times: Meri-Lapin Kanteleensoittajat, The Concert Organization Ave Sol kokle group CANTATA, Lempäälän Helkanuoret, Palo, LuoMuKanteleet, Kanteleyhtye Kaarna, Ida Vellamo, Armahat, Kannellen, Tuulikannel and Metka. I forgot to mention in my last letter where the rehearsal rooms are located. They are inside our competition venue, Kansantaiteenkeskus. There are several floors in the building but there is also a spacious elevator. You have to be at the door of your competition hall at least 10 minutes before your stage time. It is possible to store your instruments, tables etc. at the venue. We will have a supervised instrument storage during the daytime 6.-7.5. and by night the instruments are transferred into a locked storage room. You can bring your instrument to the Ktk already 5.5. in the evening if you want. How ever, if you have a chance to store your instruments in your accommodation, please do so (if you move by a car) because there are over 300 kanteles in the competition. Please mark all your instruments, instrument cases and other equipment clearly with your name and phone number (or guardian’s/teacher’s number). 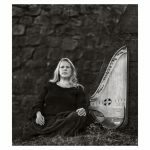 As is stated in the rules, we kindly ask you to bring your own instrument tables, adjustable chairs and note stands especially if you are a large ensemble. 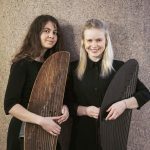 If you don’t have the opportunity to bring your own equipment, please contact the producer soon and we will try to arrange something for you but please keep in mind that our tables are suitable mostly for Finnish kantele types. – the number and location of chairs, tables and possible note stands etc. on the stage. You can draw the stage plan by hand or use for example with Google Drawings or some other program. In the Example stage plan (drawn with Google Drawings) there are three big kanteles that need tables and chairs and two small kantele players who play their instrument in their lap. So as you can see, you don’t need to include the instruments at all in the stage plan. We have arranged a buffet on participant’s own expense at the Hotel Kansanlääkintäkeskus. It is possible to eat there on Friday 5.5. 18.-21, Saturday 11-15 and 18-21 and on Sunday 11-15 o’clock. We will send more information about the meals closer to the competition. The venue along with other useful places are marked in the map. Please tell me if you have any wishes concerning the map! We will gather an info package on the website of the competition that contains this map and other practical information concerning the competition. You should save this address in you smartphone so that you will find it easily in the sompetition (there is Wifi). Of course, there will also be an information desk where you will find the info.